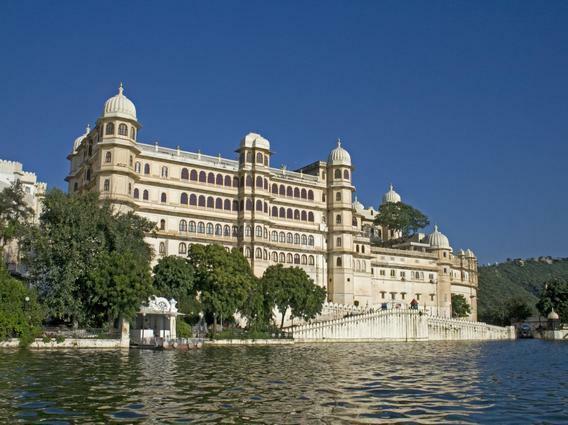 Fateh Prakash Palace Udaipur was built under the reign of Maharana of Mewar, Maharana Fateh Singh, in the early 20th century. The palace was constructed for the very purpose of hosting exclusive royal functions and so accommodating the coming guests. Of late, it has been acquired by HRH Group of Hotels and is known for offering traditional Marwari Hospitality to the modern guests. 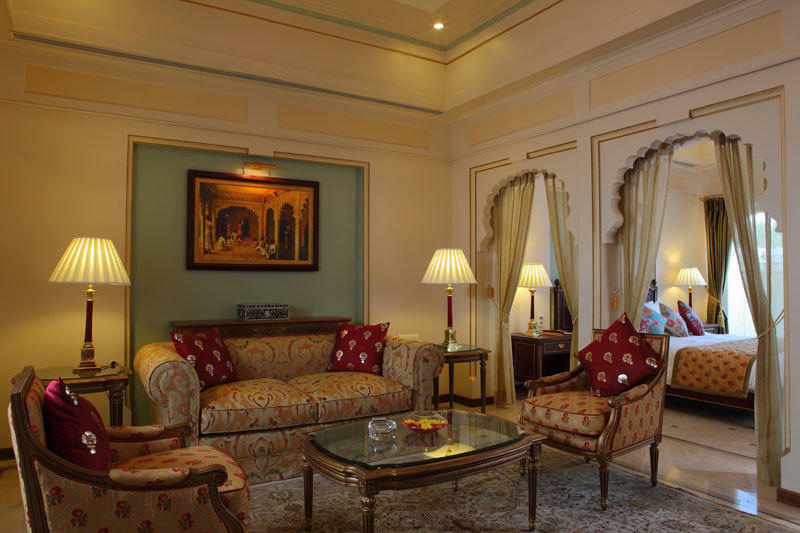 Located on the shores of Lake Pichola, Fateh Prakash Palace is just walking distance away from the City center, Crystal Gallery and City Palace Museum. Give a visit to the famous religious spot “Jag Mandir”. 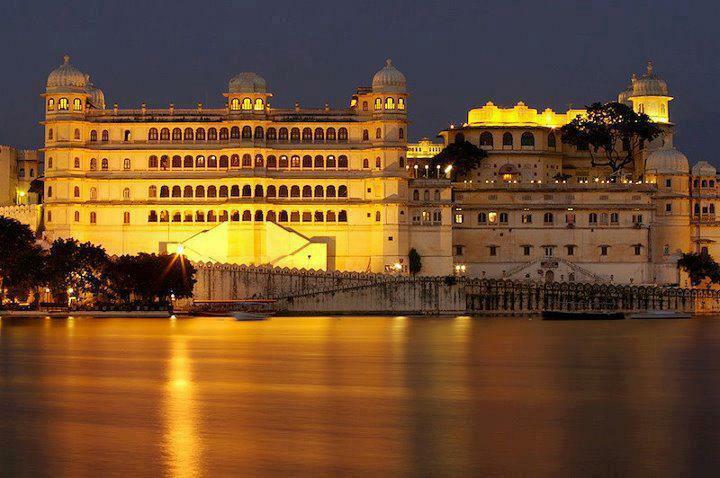 Book a day tour for Heritage Walk of Udaipur, local cultural programs & Handicrafts emporium. 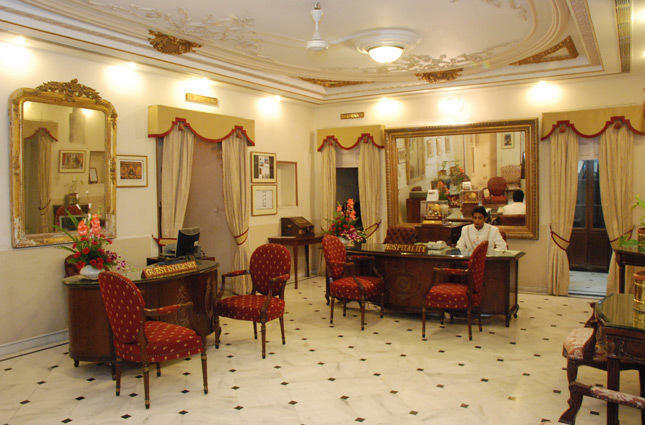 The Palace can be reached from Maharana Pratap Airport, which is about 26 km away or from Udaipur railway station, which is around 4 km from the Palace. 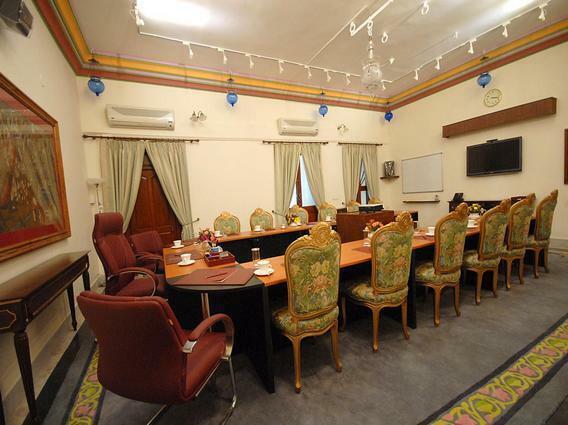 The palace boasts about its use of original miniature paintings, antique artifacts, period furniture taken out from ‘Tosha Khanas” (Royal storerooms) and the armory of Mewar Dynasty. The talking point of this palace ‘The Durbar Hall Sabhagaar’ (the conference and meeting area) had its foundation in 1909 by Lord Minto, the Viceroy of India. Earlier it was named as “The Minto Hall” in his honor. For recreational activities try their spa, out door pool or the health club. A total of 21 Lake View Dovecote Rooms are for luxury living in budget. 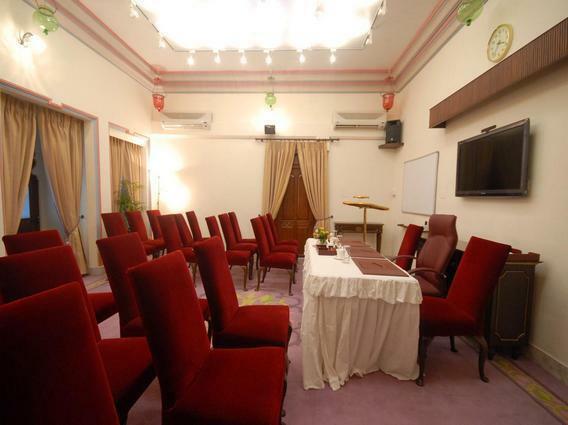 It is apt for business travelers, leisure travelers or small groups for a quick holiday getaway. The guest rooms are fully air-conditioned and come equipped with master bedroom, sitting chairs, dining area furniture and executive work desk space. The archway leads to a separate living room. 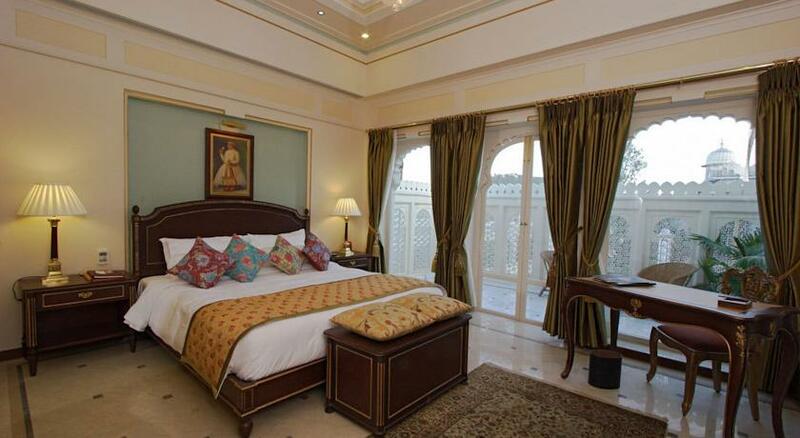 The arched bay windows offer breathtaking view of beautiful Lake Pichola and the terrains of Aravalli Mountains. You have the option to choose Double bed or Twin beds rooms. Simple yet elegant the rooms are given bright colored theme decorated with period furniture, original miniature paintings and painted high roofs. The basic amenities for you to enjoy in the room are – In room safe, Wi-Fi internet access, tea coffee maker, cable television, refrigerator, international direct dial facility and a well stocked mini bar. The modern furnished private bathroom features bathtub & shower set up, bathrobes, slippers, hair dryer and other complimentary luxury toiletries. All the 14 Dovecote Premier Suites are a home away from home. Families and small group of friends on a holiday break to Udaipur shall prefer this place to stay. 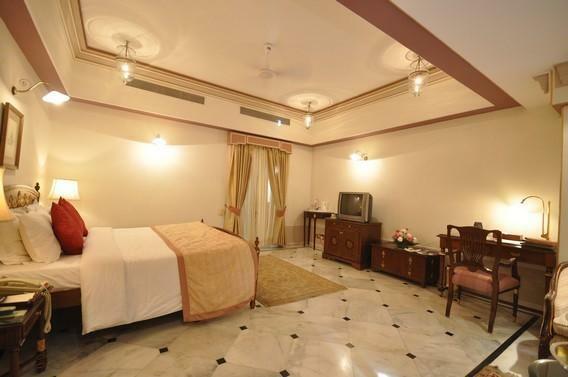 For this suite you can give your choice for Double bed or Twin beds rooms. 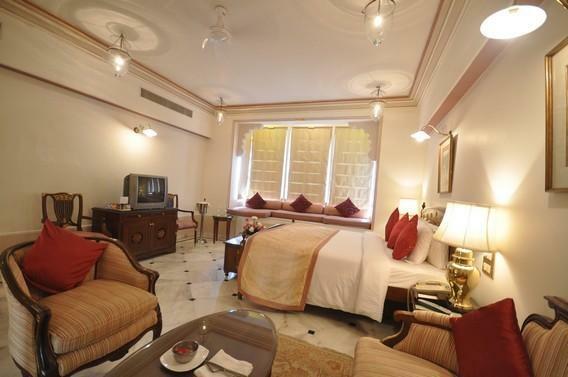 The suites are fully air conditioned with a spacious master bedroom along with an executive work desk. It also accommodates furniture for sitting and dining purpose. Stroll into living room and cross the beautiful archway. The private balcony opens to the palace features and gardens. Experience the mesmerizing view of Lake Pichola ringed by the terrains of Aravalli Mountains through the arched bay windows in the rooms. 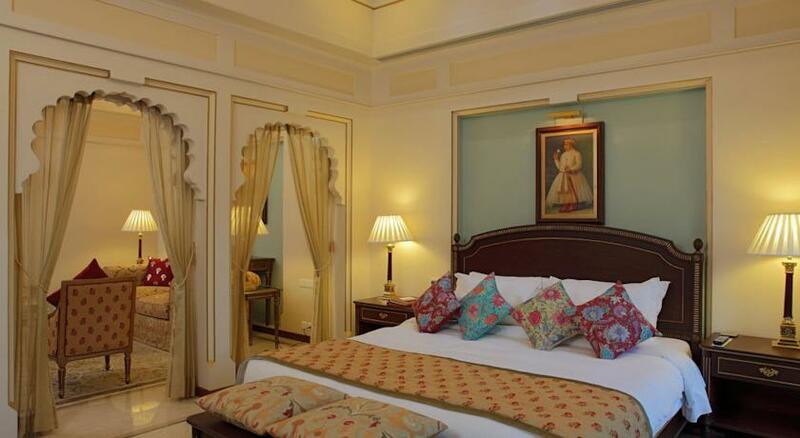 The luxuriously decorated suites are equipped with premium bedding, period furniture and original miniature paintings placed in bright colored theme of the rooms having high painted roofs. The in-room amenities for you to enjoy are – cable television with DVD player, Wi-Fi internet access for entertainment, tea coffee maker and mini bar for some breweries, newspaper, refrigerator, in room safe and international direct dial facility. The stylish furnished private bathroom has bathtub and shower combination, slippers, bathrobes, hair dryer with complimentary luxury toiletries. 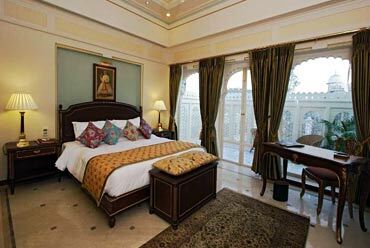 All the rooms of Hotel Fateh Prakash Palace are impressively adorned with period furniture and original portraits and radiate royalty. 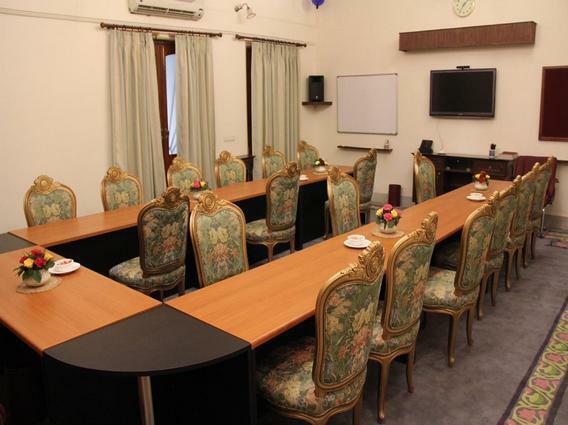 They are provided with all essential amenities to ensure optimum level of comfort. 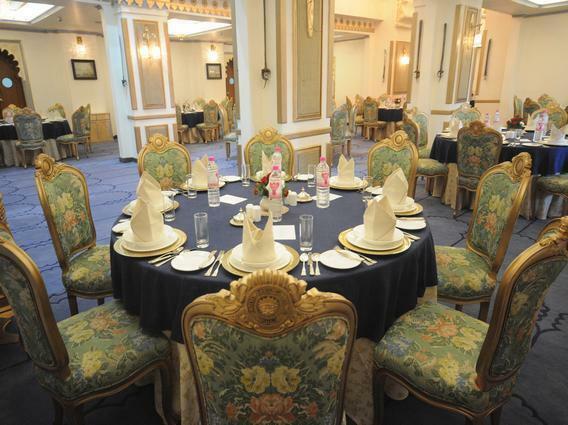 The Sunset Terrace is known for its fine dining service all over India. Located at the terrace, this is an open area restaurant, best to dine at during evening. 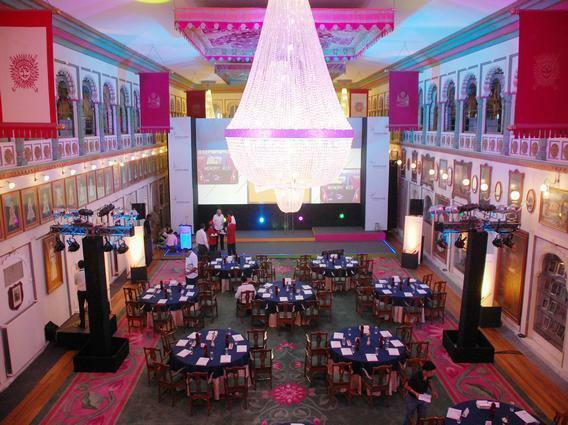 The romantic ambiance is maintained with an array of pole lamps and subtle themes furniture. On the cards are special cuisines from Continental, Chinese and Indian style of cooking. Open for breakfast, lunch and dinner come to this place to be around Udaipur’s famous landmarks – the palaces, Lake Pichola and Aravallis in the backdrop. The mood is lit up by the live musical performances by the maestros. The bar goes by its name ‘Surya Darshan’ which means watching the sun. What it literally denotes at this place is the English Afternoon Tea Service from 3 pm to 5 pm. At this time grab a drink and take the open area deck to sit back and watch the sun setting behind the Aravalli Hills reflecting its colorful spectrum through the water of Lake Pichola. The setup of the place is like a large gathering of people to have conversation and know about each other. Enjoy your choice of cocktails and mocktails at this place.